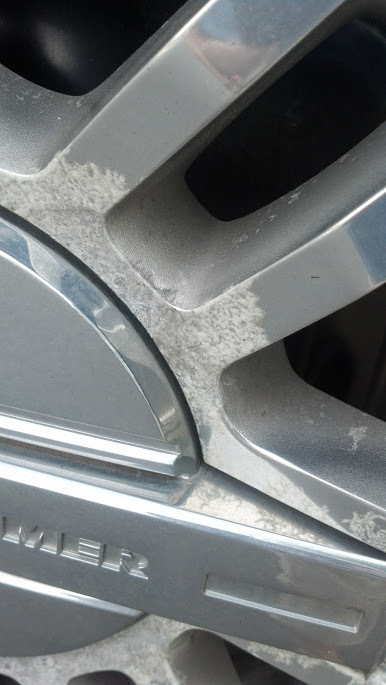 This showed up on my wheel and my SS brush guard after this winter (see picture). Anyone know what it is? Should I try CLR on it or will that hurt the SS? 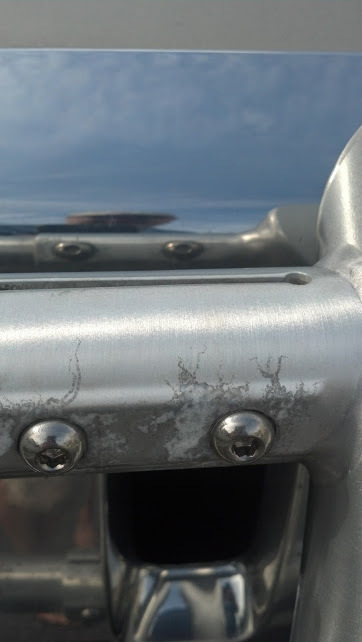 it's hard to see if your rims are plated or not, but it looks like corrosion on your aluminum base metal under your plating. regardless, it's aluminum corrosion of some sort. SS is stain and corrosion resistant, not impervious. SS grades are based upon chromium and nickle content, automotive grade (300 or 301) still is subject to corrosion, it just oxidizes in a different fashion than carbon steel. Once the surface does begin to become covered in an oxidation state, it causes the layer beneath to have oxygen deprivation. Those SS grades still have problems when exposed to certain chlorides like those in ROAD SALT. So add salinity (road salt) to surface corrosion, you can get penetration and pitting. In other words, polish that crap off now. As to your rims, the chrome plating surface has become oxidized allowing aluminum to come through to the finished surface. You might be able to polish out some of that, but it will come back quicker the next time. Yep - looks like the typical road salt and hard water (think parking near sprinklers) build-up and corrosion we get around here. Personally I'd try something like CLR first to see if any of it can be cleaned off, but I agree with the others about corrosion underneath. what about powder coating your riims black? that is what I did when I started getting that corrosion. best thing i ever did. Looks awesome.